dont know what had happened to me..
i've been sleepless for sometime..
dont even know what happen..
like today,25th of may [monday], i woke up at 3 something..
at the whole night i think i didnt even sleep well until that 3 something..
please someone tell me what was happening..
i'm so tired yet i couldn't sleep..
wrote this with sore eyes, tired body and also blank mind..
i act to be delightful and extreme happy..
but actually i jux wanted to release my tension..
so stress until i couldnt even sleep..
when i finally fall asleep, i'll be waking up a hour or two later..
i need someone to help me..
but i just couldnt find a suitable person to help..
my baby angry so fierce looking..
saw him also will heartache [xin tong]..
i'm so useless la.. cant make him smile also..
also dunno how to comfort him..
what i can do is only looking at him..
a few of us sat in class chit-chatting..
i remember that time i answered 'if he does, i'll wish them happiness'..
that time i feel a little hurt by that question b'cuz we just started our relationship not long ago..
cuz.. i love him very much and i dont have the guts to know this kind of things..
i rather kill myself and let our memories to be beautiful beautiful memories..
you will be like me one day if you started to love a person very much..
cuz i thought those person suicide for love is so stupid last time..
love makes people to have weaknesses..
well, i do hope all of you have a person you love and he/she love you too..
i'm in happiness situation currently..
and i hope this wont change forever..
came across these few love quotes..
i don't know how long we can be together but just let me be the one..
and now i know that all i want is you in my life..
luckily the 1st week is orientation week..
but starting next week.. i couldnt imagine..
>.< so lazy to study..
let u c my current photo..
haha... taken while waiting fren to fetch..
did i look more mature? with this black hair and a new specs..
cuz i might need some time for another post..
i had dye back my hair to black..
black + curly = totally like an 'a ma'..
n tat pretty girl still cut my hair until so short.. double a ma..
well.. tis is a sacrifice for my studies..
did i look like i had lose weight?? haha~~ my mum said yes.. she said my arms smaller a bit..
but i dun think so leh.. like same only..
honestly.. i love my mum a lot..
cuz she know im on diet..
but she jux couldnt bare to see im getting thinner..
she's kind of 'xin tong'..
so she ask me what i want to eat everyday..
she tried a lot of dishes to let me eat more..
but cuz of diet.. i still ate a little only..
she ask me not to diet anymore..
but she's happy i'm losing weight..
she so funny, isnt she? the one always take care the health of our family..
i.. i couldnt breath when u tell me that on msn..
i seem regret for the past..
i dunno how to respond..
u can use it at HOME..
cuz it might weird when u use it outside..
like when u r doing homework..
n dun wan ur hair to interrupt u activity..
so u can use it..
haha.. if u wanna buy..
i can help u buy..
hey.. u all heard of tis?? 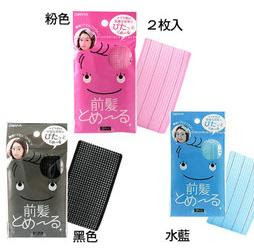 i'll upload some picture of how to use tis..
is a very useful stuff o ..
it helps to put ur fringe in position so tat when u wash face the fringe doesnt get wet too..
n i will ensure that i'll update it more often..